Michelle Dunn- Columnist and Author: It is very hard to be a vegetarian when your family is not. Do you cook separate meals for everyone? With this book, Geraldine Hartman has created some great recipes that even the meat lovers in your family will love. I tried the Mexican Burrito Dinner last night and my whole family enjoyed it and had seconds and thirds! I have 2 teenage boys so that is a big deal. I plan on trying more of the recipes which are in a very easy to read format. the preparation instructions are short and to the point. It is very easy. I think you will be pleasantly surprised with the recipes in this book and if y ou are like me and trying to have a healthier diet, this is a book you should buy. I highly recommend it and my family asked me to make the Burrito dinner again! Kudos! Sandy Carlson-Writer, Connecticut USA: Not Just for Vegetarians is my kind of cookbook. Canadian cook and writer Geraldine Hartman’s beautiful cookbook offers delicious, doable recipes that combine vegetables with spices and other ingredients that are likely in the house to make new combinations that flavorful warm and satisfy. For me, that’s saying a lot because: I don’t eat (much) and I don’t cook. Further, as a vegetarian, I have had my fill of cookbooks full of recipes that require me to drive to the ends of the earth for a pinch of some spice I’ll never use again. 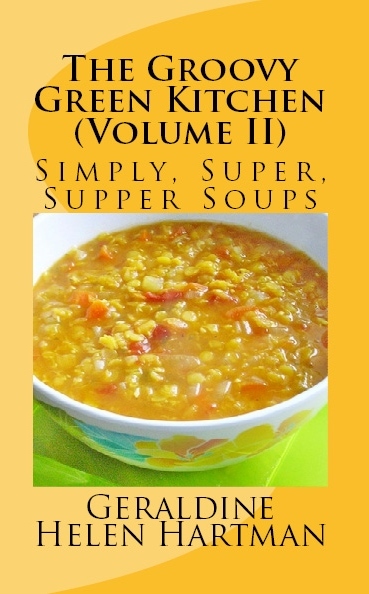 This is a cookbook for people who eat and cook every day; supper is a special event because it’s for the people you love, not because it’s actually happening in the house for a change. This book has been a whole new experience for me because it has me interested and eager to try some variations on themes I know and love: Extra-Hearty Veggie Soup,Pumpkin Loaf, Winter Harvest Soup.Easy Baked Apples, Zucchini and Cheddar Fettucini…The book is beautifully designed. It is as elegant as it is homey and warm. William Hammett- Writer, Louisiana, USA: Not Just for Vegetarians by Geraldine Hartman is a book for people who enjoy good, healthy food. What impressed me most when I first read it was that the recipes for main dishes do indeed contain complete proteins which had always been an issue for me when considering vegetarian meals. Not to worry. These recipes will keep your body finely tuned…and wanting more. The book covers all culinary areas: muffins and breads, snacks and appetizers, soups and salads, main dishes and desserts. Whether you are looking to change your diet completely or simply add some variety to your cooking, this book has it all. Apple Jade Blackwater-Writer, Pennsylvania, USA: Not Just for Vegetarians is more than a vegetarian cookbook. Geraldine has crafted her book to be a friendly, helpful voice to inspire creativity and experimentation with healthy foods. Books like Not Just for Vegetarians help to move us away from bland, packaged foods and back into the substance and soul of our kitchens. Regardless of whether you live a vegetarian lifestyle, Geraldine Hartman’s cookbook offers recipes that will delight everyone at your table. Read the full review at: AppleJade. Ann Duntley, Maine, USA: I am not a vegetarian, but am always looking for alternate ways to include healthy choices in my diet. Not Just for Vegetarians is an excellent resource for someone such as myself! The foods are flavorful and the recipes are easy to follow. And if like me you are limited to the grocery store for meeting your shopping needs, you will find that all the ingredients are readily available. The scones are to die for and the Tahini Terrific No-Bake Energy Bars are a favorite of mine on those days when I need on the go snacks. And the Savory Cheddar Cheese Muffins? Don’t even get me started! Too yummy. I highly recommend this book to all cooks, non-vegetarians included. You’ll find some old favorites beautifully re-created in a healthier way and new recipes that are destined to become staples in your meal planning. The Meatless Monday Campaign: An avid vegetarian cook, Geraldine Hartman is the author of: Not Just for Vegetarians, Delicious Homestyle Cooking, the Meatless Way. This wonderful cookbook was a finalist in the USA Book News Best Books awards. USA BookNews.com: Delicious and healthy recipes for any occasion. Highly recommended! Award-winning finalist USA Book News Best Books Awards 2006. The Cooking News: Let’s say you’re not normally a vegetarian but you either want to cut down on your meat consumption or you’re interested in preparing a nice meal or two for someone who is a vegetarian. Where are you to look for recipes that can satisfy both sides of the table, so to speak? Well a good place to start is Geraldine Hartman’s : Not Just for Vegetarians, cookbook. In it you will find lots of recipes that should have great appeal not just for people who have given up meat, but meat-lovers and vegans as well (there are several recipes with vegan variations). Many recipes are also nicely photographed, in photos that combine multiple dishes from a section. It’s a nice presentation. Read the entire review here. Midwest Book Review, Oregon USA: For reasons of improved health, animal protection and spiritual harmony with Mother Earth, more and more people are becoming vegetarians. Not Just for Vegetarians is the ideal compendium of delightful, delicious and easy to prepare dishes that will inspire vegetarians, whether novice or experienced, to have wonderful meals that they can share with vegetarians and non-vegetarians alike. This 172 page cornucopia of recipes is nicely illustrated with color photography, a Glossary of Terms and the diverse dishes are organized into chapters dedicated to: Muffins, Scones, Breads and More, Family Favorite Snacks,There’s No Taste Like Home-Family Favorite Redo’s, Salads, Dressings, Sauces, Salsa and Spreads, Main Dishes with a Difference to name but a few. From Auntie Blanche’s Cottage Cheese Scones, Tahini Terrific No-Bake Energy Bars, Meal in a Bowl Cabbage Soup to Deep-Dish Potato Pie,Mushroom Stroganoff with Herbed Pasta and Easy Chocolate Hazelnut Clusters; Not Just for Vegetarians will appeal to any kitchen cook for any dining occasion whether or not everyone sitting at the table is a vegetarian. The City Hippy, United Kingdom: A. Tepper aka The City Hippy loves this book! In my quest to eat less meat, books like these are crucial. Making vegetarianism mainstream gets easier with recipes like this. Not Just for Vegetarians contains recipes you can serve to meat-eaters too. Recipes that just might make them realize that meat-free meals can tantalize, satisfy and impress. BUY THIS BOOK! Read the full review here. ReallyNatural.com: Not Just for Vegetarians is a whole book of opportunities for me to look like a star! Read the entire review and check out some recipes from the book at: ReallyNatural. Nava Atlas-Cookbook Author: Not Just for Vegetarians offers baked goods, snacks and appetizers, soups, salads, dressings, sauces, spreads, main dishes and desserts. The book is well-edited, easy on the eyes, and includes both U.S. standard measurements and metric conversions. I think this cookbook is perfect for those just testing the vegetarian waters who want to start with hearty, family-style fare. Savvy Vegetarian: This is an ideal cookbook for transitional vegetarians, also for non-vegetarians who want a healthier, lighter and more varied diet. Geraldine’s recipes are both flexible and blissfully familiar. If you have a comfort food that you remember from childhood or want a favorite family recipe in a vegetarian version, Not Just for Vegetarians is just for you. Kristin L. Ball, Chapel Hill NC USA: My new favorite cookbook! Not Just for Vegetarians is wonderful! The recipes are straight-forward and refreshingly home-style. It’s been tough to find veggie redo’s of some of my favorites until now. Try the Mushroom Stroganoff with Herbed Pasta, Veggie Meatloaf (amazing! ), The Best Scalloped Potatoes, Pumpkin Loaf and of course, the Savory Cheddar Cheese Muffins! I can’t wait to try the Veggie Chickburgers and Sweet and Sour Red Slaw. I’ve incorporated many of these recipes into my weekly cooking. Simple and always tasty! CarolinaPurl, NC USA: Last night I made Geraldine Hartman’s : Tahini Terrific No-Bake Energy Bars. Jason (my son) and I had one for breakfast this morning. Actually Jason had one and a half! We both loved them. So moist and chewy with the raisins and coconut. I brought one to work for an afternoon pick me up snack. Thank you Geraldine, for sharing this great recipe from Not Just for Vegetarians. I’m looking forward to trying more recipes from this cookbook, very soon. Pinoy Cook- Food Blogger, Philipines: Geraldine’s Potato and Raisin Scones are just marvelous! Just marvelous! I don’t think I’ll be content with pancakes for breakfast, ever again. Read the entire review at: Pinoy Cook. Madelyn Miller: Guide to Healthy Eating and Lifestyle Books: Not Just for Vegetarians was one of Madelyn’s pics for the best new books (and cookbooks) on diet plans, lifestyle improvement and improving your body and health. The Montreal Gazette: Offers alternatives for people who want the occasional break from going “whole hog” on the meat! VeggieTable Newsletter: review by Laura K. Lawless. Not Just for Vegetarians, Delicious Homestyle Cooking, the Meatless Way is a unique cookbook. Most vegetarian cookbooks are either a vast assortment of general recipes or in-depth collection of dishes belonging to one type of cuisine. Not Just for Vegetarians falls somewhat into the latter category. Geraldine Hartman offers a variety of recipes for hearty home-style dishes, the kind of food you think of as “stick to your ribs” and “down home cooking”. Read the entire review at: The Veggie Table. Elaine Eggum, Regina Saskatchewan Canada: I would like to say that since trying some recipes in this book, our meals have become much more tasteful. One recipe we tried was the Broccoli and Cheese Bake, my family all found it very, very good. Another one that I would like to mention is the Savory Cheddar Cheese Muffins, they are just scrumptuous! There are many more recipes I am looking forward to trying. I would like to thank the author for writing a book that is good for everyone, not just vegetarians. Justin Williams, British Columbia Canada: I tried the Veggie Chick Burgers recipe last night and they were very tasty! For someone who doesn’t cook much, it went very well. Cheers! 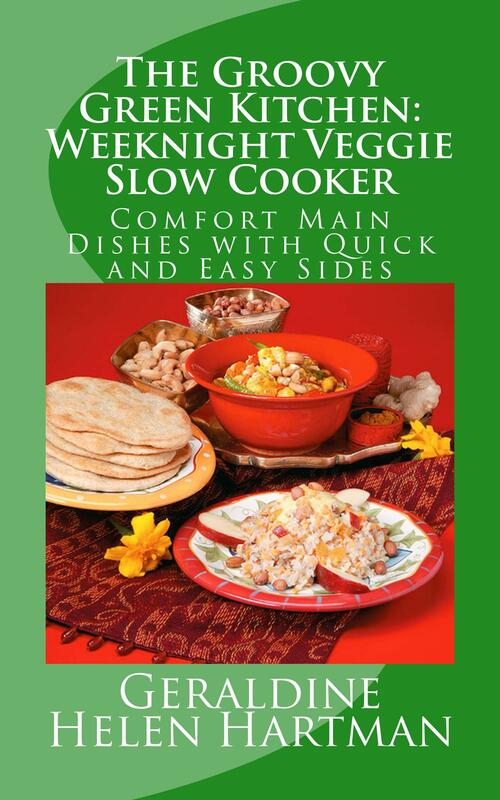 “Veggie Guy”, British Columbia Canada: I have been fortunate to have enjoyed many of the recipes from this book. Although I AM a vegetarian, I would also highly recommend this book to anyone who enjoys great, home-style cooking…meat-eaters or vegetarians unite! Some of my favorite recipes include: Veggie Stew with Parsley Dumplings, Family Favorite Lasagne,Red, White and Black Chili, Rosemary Flax Buns, Chocolate Chip Pizza…to name but a few! I’m getting hungry, time to head to the kitchen and get cooking again. With this cookbook, I CAN cook! VegetarianWomen.com: Over a decade ago, before making the choice to eliminate meat from my diet, I recall feeling intimidated at the thought of going vegetarian. What would I eat? How could I, one of the few people on the planet who dislikes raw tomatoes, be a vegetarian? Of course, liking every vegetable is not a prerequisite to becoming a vegetarian. In fact, there are no prerequisites (except of course the bit about the meat!). Going vegetarian whether for a trial period or a lifetime can be as easy as pie, particularly if you have a cookbook like: Geraldine Hartman’s Not Just for Vegetarians. The wide variety of straight-forward, easy to prepare recipes contained in this book are not the least bit intimidating and include ingredients that you’ve probably been cooking with all your life. If you are looking to reduce or eliminate the meat from your family’s diet, this cookbook will certainly help make the transition a great deal easier. The Galveston Daily News: Want to up your veggie intake but not totally ban favorite foods like chili and burgers from your life? Geraldine Hartman has written: Not Just for Vegetarians, which expands the variety of veggie preparations in the reader’s household so that everyone in the family will be happy with the final dinnertime results. In Hartman’s non-ism guide, you’ll find recipes for:Red, White and Black Chili, Pasta Primavera with Fresh Pesto Sauce, Family Favorite Lasagne and Veggie Chick Burgers. LubbockOnline.com: Not Just for Vegetarians by Geraldine Hartman is the answer to reducing meat consumption without giving up favorite family foods. The Pennysylvania Mercury: Add new culinary dimension to your cookbook collection. A new cookbook that could make finicky eaters clean their plates! Not Just for Vegetarians by Geraldine Hartman contains a mouth-watering collection of no-nonsense, home-style recipes that will appeal to everyone at your table. Carolina Woman Magazine, NC USA : Offers veggie entrees so tasty, you won’t even miss the meat! Check out some of the recipes and complete article. The Indiana Gazette: Not Just for Vegetarians by Geraldine Hartman is a great cookbook choice, no matter what your diet preferences are, vegetarian or meat-based. Read It and Eat It, Lois Friedman’s Food Column: Not Just for Vegetarians will get you ready for summer eating and summertime fun…where the living is easy! Easy to make meatless recipes from this Canadian author that are easily adapted to feed two people or a crowd. Dos Mundos/Two Worlds newspaper, Kansas City, MO: Either for health or ethical reasons, more and more people are looking for different ways to reduce meat in their meals, without giving up their favorite dishes. Not Just for Vegetarians offers just that. Bon Appetit! The Express Times PA/New Jersey.com: The Many Sides of Summer, colorful veggie sides of salads with creative dressings. In her book, Not Just for Vegetarians by Geraldine Hartman, the crisp and delicious crunch of fresh salad greens with added homemade dressings bring out all of nature’s best flavors. The Daily Telegram, Michigan: Not Just for Vegetarians features many vegetarian versions of familiar family favorites, along with new recipe ideas to help expand the home cook’s vegetarian repertoire. Tidings Magazine, Toronto: Whether for health or ethical reasons, more and more people are looking for ways to reduce their meat consumption, without giving up their favorite comfort foods. Not Just for Vegetarians is designed for vegetarians, semi-vegetarians and meat-eaters wanting to add variety and to make some delicious and healthy changes to their diet. VeggieHeadOnline: Robin Lickel-Editor: Thanks Geraldine. I prepared the Broccoli and Cheese Bake and the Roasted Parmesan Potatoes. My dining companions all happened to be vegetarians and they enjoyed the recipes, very much! The Calgary Sun: Eat your veggies! Here’s another meatless option: Geraldine Hartman shows how vegetables can star in your meals, adding to the nutrients you put on your plate in her cookbook: Not Just for Vegetarians. The Manitoba Grain News, Winnipeg,Manitoba: A fabulous Canadian cookbook, Not Just for Vegetarians! Geraldine Hartman has authored a cookbook for all folks who enjoy easy to prepare home-style cooking and who choose to eat meatless for any day of the week. And do try those rainy-day perfect soups to whet your appetite for all those other amazing recipes! Arctic Radio, Thompson, Manitoba: When the word vegetarian comes up, meat-eaters usually scowl and follow it up with claims like: “I will not eat like a rabbit!”. Well, you really don’t have to and there are a number of recipe books out there with great dishes to sample. Geraldine Hartman has written one of them and it is called: Not Just for Vegetarians. She explains that you CAN be a meat-eater and still enjoy a great recipe. Growing Saskatchewan Magazine, Saskatoon, Saskatchewan: Not Just for Vegetarians. Meatless for a day or every day. Your family will ask for these amazing no-meat recipes, again and again! The Regina Sun, Regina, Saskatchewan: We all know, whether we admit it or not, that we should be eating more vegetables and fruit. Not Just for Vegetarians is designed for everyone wanting to add more vegetable and non-meat dishes to their everyday menus. These home-style recipes are flavorful and easy to make.